Prince George, B.C. – Last night’s evacuation order in 100 Mile House has drastically increased the number of Cariboo residents seeking shelter in Prince George. According to the City of Prince George this morning, roughly 800 people have now registered at their emergency reception centre at the College of New Caledonia. Those who’ve checked in have received such services as food vouchers and lodging. The influx of evacuees is expected to exceed housing capacity in the College gymnasium and draw on the 200 beds set up yesterday at the Charles Jago Northern Sport Centre at UNBC. The City says the extra evacuees has also lead it to set up additional accommodation at Prince George Secondary School where hundreds of extra beds will be installed in the gym today. Last night Prince George Fire Chief John Iverson and local representatives of the Red Cross held a town hall meeting at CNC to provide an update on evacuation services. It included an overview of the Red Cross’ new registration system which enables family and friends to know the whereabouts of loved ones and allows the Red Cross to contact people directly as more information and assistance becomes available. You can register at 1-800-863-6582 or online here. 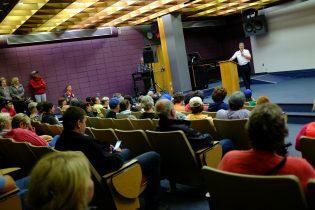 Local residents wanting to provide accommodation for a person or family place a posting on the City’s Facebook page, www.facebook.com/cityofpg. now to figure out how to get food and supplies into PG. the roads south are all closed. So from Alberta now? keep forgetting about that route.